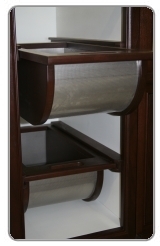 You will find a wide array of functional and beautiful accessories to add to your cabinetry. 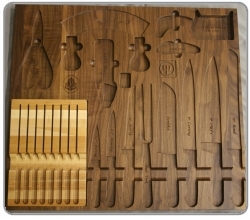 From our beautiful knife drawer collections to our unique cutting board set. These items will be a part of your space that give you pleasure each time you reach for them. 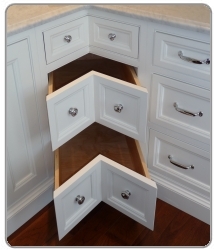 The interior of your cabinetry should have the same attention to detail that is provided to it’s outward appearance. A space for everything and the best way to access it in the place where it is needed. A variety of items designed to make your life easier. Pop-up mixer shelves, rollout trays, spice racks, dish drawers and so much more will provide you with the easy access you have been wishing for. These maple chop blocks prevent you from mixing flavors that don’t go together by separating cheese, garlic, fresh herbs, meat, poultry, and vegetables. Each board is 10-1/4” wide x 14” deep. They come in a 12” wide x 11-1/2” high x 12-1/2” deep walnut case that has traditional through dovetails (like the hand cut dovetails on most fine furniture over 100 years old). These Stainless Steel Vegetable Bins have become popular because, unlike wicker baskets, they don't easily rot when a vegetable does. Stainless Steel Vegetble Bins look great in every contemporary and traditional environment, and they are available in every wood species. If you store potatoes, onions, etc., this will be a must-have in your new Pennville or Epicure kitchen. 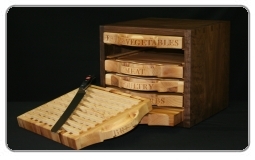 - "Ultimate Collection" Simply the utltimate set of knives that are available. Wusthof was originally chosen because every time we were researching kitchens in famous estates, these were the knives that we saw. - "Culinary Collection". 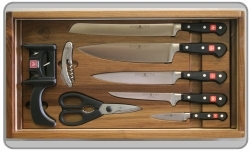 All of the knives a Top Chef would use including: A 9" Cooks knife; a Santoku (Japanese Cook's Knife); a Pairing knife, a Utility Knife; a 10" Bread Knife; a 9" Carving Knife and a Meat Fork; a Flexible Fillet/Boning knife; a Two-Handled Mezzaluna; Come-Apart Shears; a Waiter's Corkscrew; a Sharpener, and a Garlic Press. 8 Steak Knives are optional.